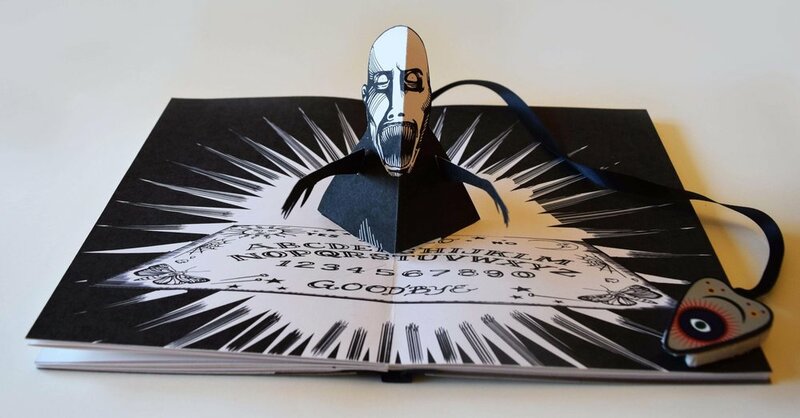 The Curse of the Malevolent Book Spirit is a fully illustrated, playfully haunted book about a haunted book. As the story progresses, the cursed spirit becomes more active. A ribbon attaches a miniature planchette (UV reactive light) to reveal hidden spooky text and imagery. Pop up and movable mechanisms can be manipulated to awaken more paranormal activity. The artist is not responsible for any possession, invocation, or otherwise demonic occurrences that may arise due to the misuse of this book. Images are drawn digitally and inkjet printed. Movable mechanisms are hand-cut and assembled. Planchette attached to ribbon can be removed to replace battery if necessary. Numbered and signed edition of 100. The Curse of the Malevolent Book Spirit can be purchased through Coyote Bones Press’ Etsy Shop or by contacting the artist directly.